I had fun when I was a kid wearing my older brother’s comparatively giant winter gloves. They had great padding for punching snowmen and because they were big and heavy they would easily slip off on command to simulate rocket hands. Oh, wow; those remind me of welding gloves. When I worked on the flight line in the winter, standard issue was a pair of normal wool gloves, and over those we wore a sort of thick, lined leather mitten. Of course, when actually changing a part out in the negative twenties(with lots of wind), there was no way to wear either, let alone both. I learned to change those parts in spurts of activity, followed by several minutes in the gloves trying to get my hands warm enough to do it again. I also found out that wool will keep your hands from freezing instantly, even when soaked in oil. Still, I came awfully close to frost burn a few times, and my hands ache when they get really cold, now. I know the feeling of cold winters, I worked up North for 2 years in temperatures of around -40C (roughly -40F as well). Wool gloves won’t help much if you get diesel fuel (I know from experience) on them but they are better than nothing. 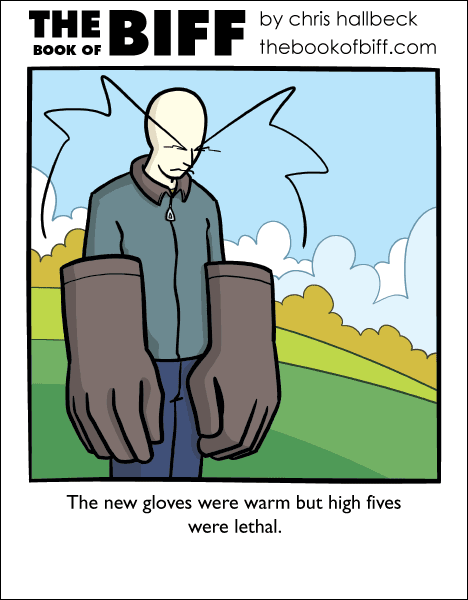 Anyway!, comicly large gloves, Hurrah! Unusual clothing week is going great. High fives my a**! Try pimp-slapping someone with those! I too have experienced being shut inside one. Although for me it was ok because I have rather high tolerances for both heat and cold. It was kinda fun spitting on the metal floor to see it instantly freeze on impact. I used to drive open-cab snow removal equipment in heavy northern winters… I still have the massive real fur-lined over-mittens (gloves and glove liners go inside) that kept my hands from falling off at oh-dark-thirty in minus 30(f) weather. This one is definitely one that made me laugh out loud. They’re all funny, but this one I actually laughed at. That and Monday’s comic. @Space Butler: Ah, but is it not remarkably usual to find something in the pocket after a long spring, summer and fall? Is he looking at a friend that fell over after they high fived or sad because he can’t give high fives? Yeah. Yeah, I could *really* use a pair of those for delivering mail parcels. Sorry, couldn’t resist, I will just go sit in the back now. ….Why did my mind default to that one high-five scene from Jackass 3D? @justpassing – you should meet my step-father, he likes the same kind of horrible puns as you!